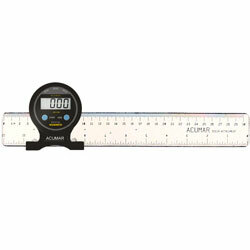 Digital Inclinometer may be attached to the ruler. The measurement axis may be rotated 90°, electronically, to read angles with respect to the vertical axis. Use for orthopedic, podiatric, chiropractic, x-ray film evaluations.